Bibles for Mormons: We have liftoff! I found a team: the United Church of Christ. I was affirmed as a member today during the service. As the pastor pointed out, I've had some transitions lately. I choose Ruth 1:16 as my scripture: "And Ruth said, Intreat me not to leave thee, or to return from following after thee: for whither thou goest, I will go; and where thou lodgest, I will lodge: thy people shall be my people, and thy God my God." (KJV) It speaks to my desire to follow the true God, to join with this people in the body of Christ. Why did I chose this church? One: they welcome everyone. 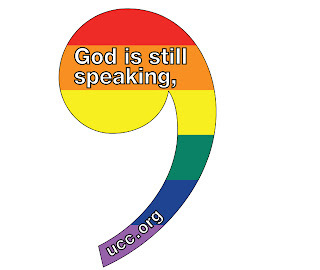 Two: their logo reminds us that God is still speaking. Three: they have a goal of being a unifying force among the churches of Christianity. And four: they are very proactive in social justice. I'm excited to see where this road goes as I travel Home. :-) and glad to be here! Felicidades para este teu novo rumo. Where did Jesus pay for our sins?